Orthopaedic surgeon Dr John Hunt started the Cancer & Bio-Detection Dogs research center in Aylesbury, England after noticing that dogs were pestering their owners on parts of their bodies that were later found to be cancerous. Dogs could be trained to detect cancer because cancer cells produces metabolic waste that is different from normal cells- even when it is during the beginning stage of the cancer. The types of cancer cells that can be detected are: prostate, lung, skin, ovarian and breast cancer. The sense of smell of a dog is 10,000 to 100,000 times more superior than of a human being. As for diabetic patients, it was found that a dog’s hyper sensitive nose can detect tiny changes when a person is about to have a hypoglycemic (low blood sugar) attack. The dog will react by whining, barking, licking, etc to attract attention of the owner. Dogs that are specifically trained as rescue dogs will be wearing a red cover to differentiate from normal dogs. 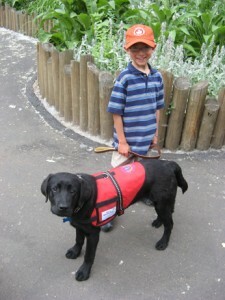 Dogs can also be trained to detect seizures, epilepsy, to help the blind and to help the elderly.